On the 13th of August 1952 the Swedish ship Anna Salen was in collision with a Norwegian Whale Factory ship The Thorshovdi, in the enterance to the Pentland Firth. The Anna Salen was badly holed as can be scene in the photograph, she was taken alongside at Lyness were repairs were carried out by Metal Industries Ltd before continuing on her passage . The Anna Salen had 800 passengers on board who were returning from the Olympic Games in Helsinki. I doubt a ship would get to continue on her passage after having had such an event today. I immigrated to Australia wih my family on the Anna Salen from Germany to Melbourne arriving on the 16 Octomber 1954. I am unable to find any passenger list records for that year. Any information would be great. My family was on that crossing. I was only 6 years old but remember going into lifeboats and landing. Also hit quite a storm on the way to Halifax. I am interested in any information and passenger lists. My partner, his sister and parents (OTT family) arrived into Australia from Germany on the Anna Salen in December 1954. Would be happy to hear from anyone that arrived the same time. 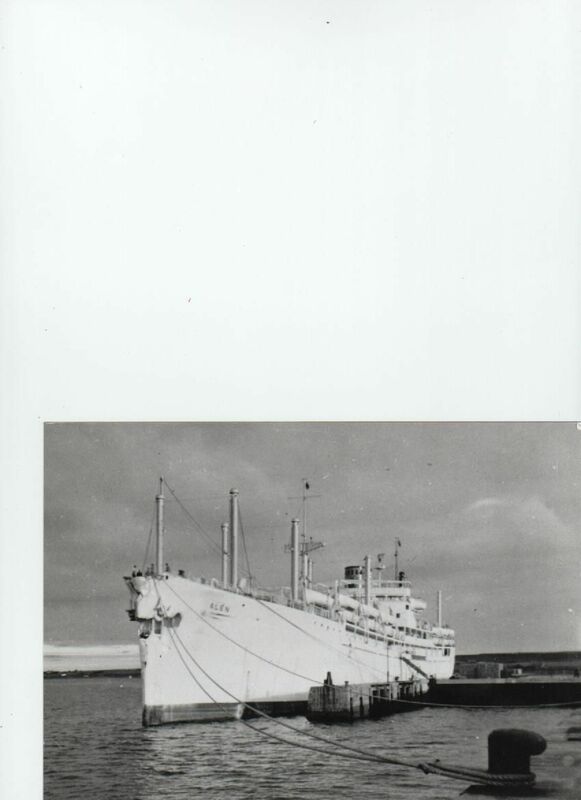 My husband and his sister and Parents (Schulze family) arrived from germany in 1953 in Australia on this ship..have not been able to find any lists, any contact would be great..
My Mom and Dad and I arrived in Quebec City Aug, 2,1953 on the Anna Salen from Bremen Germany. I was 7 months old. I would love to be in touch with anyone who was on that voyage with us. Both my parents, Albert and Ruth Jansen, are alive and well. We live in Pembroke, Ontario, Canada. I have a few pictures of some folks on the ship. My email address is bananachristiana@hotmail.com and I would love to hear from you. Great greeting to my brother Hans Hagemeier, I received yor letter last week and this letter make me happy,very happy,my greetings to all family, sister Margaret, John and Reiner. My name is Rita Harsant (nee Tesch) and I travelled to Australia aboard the Anna Salen with my sister, Monica and parents Heinz and Edith. We arrived in July 1954. I was 6 months old at the time. We were sent to Bonegilla Immigration Camp in Victoria and moved from there to Melbourne. I would love to contact anyone who may have knowledge/memories of that period. In reply to (nee Tesch) My parents were on the July 1954 arrival with my older brother Manfred who was 2 years old at the time. They to were sent Bonegilla, but only stayed there for a number of weeks before buying a small truck and driving to Adelaide where my father gained work as a carpenter. Their stay at Bonegilla was not overly pleasant as the weather was very cold at the time and the huts had no supplied heating, however my parents did buy an electric heater where allowed to plug it into the light socket by one of the supervisors even though it was against camp rules. My parents also did not like the food that came from the camp kitchen. I will be seeing my mother in a few weeks and ask for more first hand details. In reply to Ralph Olson. I would love to hear of any details your mother may remember. My parents died many years ago and spoke very little of their time at Bonegilla and the voyage out here. I do have a couple of photos taken on board during the voyage. My father was also a carpenter. My sisite, Monica was also two at that time. Wonder if they may have played together? Anyone who came from Germany to Canada on about 26 October , 1953 aboard the Anna Salen - my Father In Law was on this voyage , Arthur Schatz- anyone remember him ? Love to hear from you . My goodness I litle knew when I put the photograph of this damaged ship onto this site how far the interest would travel!!. Thank you so much, As Billy Conolly said "You have made a happy man very old"!! We have been back to Poland and Germany twice to do family research and look at all the places my husbands ancestors came from.. we watch this page with interest in the hope that someone else on that ship with my husband will turn up but so far they are all other voyages. My father was a bright-eyed 20 year old on his way to Canada aboard the Anna Salen when it was struck in 1952. He says that he and his roommates were quartered so far in belly of the ship that they didn't even bother getting out of bed. They were prepared to go down with the ship, Titanic style. Eventually the steward did come down and chase them out onto deck, where the captain was telling people not to jump overboard. He was warning them that they wouldn't last five minutes in the frigid North Atlantic waters. My dad says they just looked at the captain like he was nuts: they weren't about to jump in there! While they were waiting for repairs, my dad made friends with the American Olympic synchronized swim team, who taught him some English. I came to Australia on the Anna Salen arriving in Melbourne on 16 October 1954. I came with my parents Walter and Ingeborg Doose. My mother worked for the Purser and my father taught English on the ship. Only have vague memories of this voyage but do remember the Suez Canal and Aden. Does anyone know how to get a passenger list? My father (Klaus Uthmann) departed Germany and arrived October 1954 in Australia on the Anna Salen. He was 11 at the time and traveled with his father (Ferdinand), his mother (Maria), his brothers Ferdinand and Erwin, plus his sisters Mechthild, Helga and Monika. I am looking on behalf of my father (Ernst Dieter Tews, possibly Meyer) who was nearly 12 when he arrived in Australia in October 1954, with his mother and step-father (Irmgard and Herman Meyer) and his sisters (Irmgard (Puppi) and Helga). He is looking for any information at all that anyone can give him. I was on the Anna Salen in October 1953 with my parents Daniel and Maria Kendl. I gather from talking to my mother that Dad and I spent most of the voyage "hanging over the rails". The pictures are fascinating. We left Bremmen on the 15 Nov. 1953 on the Anna Salen. My dad's name was Theo Haarmann we had a very good trip till we got in middle of the Pacific and turned on the second water tank for drinking and in Aden they filled it with sea water. I was ten when we left. My father came over from Bremerhaven to Canada in 1953. I have four pictures of him on the ship with some other passengers. Not sure if their friends or people he met on board. I also have the postcard he wrote to my mom before the ship left port. It is post marked 02.7.53. If anyone knows when the ship left port an what day and port it arrived in Canada. I was a passenger of the Anna Salen sailing from Bremerhaven/Germany on June 16, 1952, arriving in Halifax, Nova Scotia, Canada (Pier 21) on June 25th, 1952. "way below", bunk beds. My family joined me the following year. I am now a greatgrandfather living in Ottawa and everybody is well. What were the exact dates of departure and arrival? I shall be grateful for any information. The kids want to know! Oh yes: I was not sea-sick! MV ANNA SALEN October 1954 from Breberhaven to Melbourne with my Parents Erich, Tilly and Sister Antje.I was 15 years old and have very fond memories of our trip over. To date I have not heard or met anyone from this trip. My parents, two sisters, and I were on The Anna Salen when it left Bremerhaven on Dec 17 1951, and arrived at Pier 21 in Halifax on Dec 29. My sisters and I have been trying to gather as much information as possible on our stay in DP camps (one in Heilbronn from 1946 to 1951) in many locations in Germany since we were taken from Poland by the Germans in 1942. We have a fair bit of info already but would like to fill in many gaps. Please let me know if you can help. Thank you. I was a 6 year old passenger on the Anna Salen along with my 12 year old sister and Mother and Father. We left from Bremerhaven and arrived in Melbourne a few days before Christmas 1953. We went my train to Bonegilla and the onto Orange and then went to Adelaide to live. My sister later married some one also who was on that same boat in 1953.
father worked on the Anna Salen and did several trips to Canada and Australia before the 1954 journey as an immigrant, including the ill fated trip from Helsinki. He was quartermaster on that trip. I have a few photos, some old film etc. If anyone is interested please contact me. I have other photos of the Anna Salen including some taken after the accident as my father worked on the Anna Salen on this trip and others. Later, in October 1954 our family came to Melbourne from Bremerhaven on this ship. Bridget could you please email me. Brigitte; I was 8 years old on the trip in 1952 if you have any pictures I would be very interested. I was 4 years old when I came to Halifax Canada from Le Havre aboard the Anna Salen in December 1951. I think I still remember the funny, unpleasant smell from the dining room or cafeteria. My parents were both too seasick to enjoy the food in any case. Several alarms in apparently the worst storm on the North Atlantic in 25 years at the time. I came across this site while researching on this migrant ship. I too arrived here in October 1954 and had my 7th birthday on board (19/09). Have just laboriously translated a voyage account by my father ( deceased) and found it fascinating. My own memories are vague, could not find much on migration records or ship information. I wanted to find out about the ship layout as we were a family of 8 and were split into different locations on the ship. I am retired now and want to delve deeper. Eduard and Frieda Puncken with children Hannelore, Dieter and Hilke arrived on the Anna Salen 2nd July 1954. We went to Bonegilla and then on to Wacol migrant camp in Brisbane. I am Hilke and was 9 years old and have many memories of this time. Recently I obtained interesting information from the immigration museum in Melbourne. They have passenger lists and data of families. My father sailed on the Anna Salen April 1954 to Port Melbourne from Greece. Konstandions Koukoutatsios would be grateful to hear from anyone who was on that voyage or who can remember my father. I posted earlier, re my trip across the Atlantic on the Anna Salen, I now have more details. My mother, myself (6 yrs old) and my two yr old brother sailed and arrived at Halifax on November 16 1951. Prior to sailing we were held in a DP camp for months, because every scheduled boarding was denied because my brother always presented with a slight elevated fever. I remember my mother feeding him lemon juice, just prior to testing to hopefully reduce his temperature. I remember the camps vividly, rows and rows of beds of women and children, going to the camp houses for meals,and also seem to remember women crying lots. Our trip across the Atlantic was severe in the midst of winter, my mother was very ill, and could not come up out of the bunks, I would have to go to the cafeteria and bring food down for my brother. Once we arrived in Halifax, we went on the train to Quebec city, where, the car we were on, with many other women and children, was for some reason moved around on the tracks, and left miles away from the station. It was cold, no food, and my mother had some Oreo cookies, not sure why, or where she got them, but I remember being on that track for more than a day and a night, and eating nothing but Oreo cookies. Finally one of the single women on the train decided to walk to get help, and really, they had lost and forgotten about us. I must admire, all the women, who , in that time, survived the entire journey, from the DP camps, to their final destination. Believe my father may have come to Australia on the Anna Salen in 1954/1955, possibly landing in Western Australia. He was of German origin , named Gutav Ernst Rauch. he was an electrican by trade. My parents and almost 3 year old brother arrived in Melbourne from Bremerhaven on this ship, March 13 1955. It docked in the evening and passengers disembarked the following day. I would be greatful for any information as I have been unable to find any records. For those wanting to access records try the National Archives of Australia. Either do a family name search or search for the Anna Salen specifically. Good luck all. My grandparents came out in 1954 and I have managed to find some records for them but not for viewing. Will have to buy copies! My parents arrived from Greece on the Anna Salen in 1955 arriving in Port Melbourne. There names were Efstratia and Evangelos Gianneli. They had a small child 18 months old. If anyone knows any information please email me angela_emmerson@hotmail.com. When they arrived they were seperated for a few months. Mum went to Bonegilla and I don't know what happened to my father during that time. My Mother, brother and I travelled on the Anna Salen from Germany and arrived at Pier 21 in Halifax Aug.25th 1951 from Germany. I was 1 year old at the time. I am searching any information that may help me to locate my own documentation since my parents had long ago lost my landing papers and other important information. I am now 63 and am having difficulty with my proof of citizenship and arrival. Names of DP camps, ports that the ship sailed FROM in Germany. My father, Herbert Miscchke, came across from Germany on the Anna Salen in 1952 with many men who were hired to work in Algonquin Park cutting trees. They lived in Pembrook ON on off days. Dad saved enough for my mother and brother to come live by December the same year. Dad and Mom are now gone but if anyone also travelled on that work crew I would love to hear from you. I came from Germany on the Anna Salen in July 1954, as a ten year old with my Mother and Stepfather, Anna Dorks and Walther Dorks. A;so my 22 year old brother Kurt Heimes. We left from Cuxhaven and arrived in Melbourne. We travelled to Adelaide with my Stepfather's Brother. I am the only one left now and would love to hear from anyone who travelled with us. I came from Germany on the Anna Salen on the 2nd July 1954 as a 3 year old with my parents Heinz and Emmy Klibschon, my sister Monika age 11, brother Gerhard age 7, and my brother Karl age 23 months. We left from Bremerhaven, arrived in Melbourne, and went to Bonegilla, then on to the Wacol Migrant camp in Brisbane. Both my parents are deceased, so any photos or information about the trip and destinations would be much appreciated. I would love to hear from anyone who travelled with us. To Caz Nizman - i am trying to help a friend who's parents and young sister were on the Anna Salen on the same date your family was. She said all they know is they arrived Halifax approx. Dec 29, 1951 Pier 21. They destroyed all info years ago when the parents died and now they are trying to find any info even about the ship list, etc. Her mother was born in Minsk, Russia and her father Jan Dekiel in Province of Prosno in Poland. If you can help in any way even with a ship list or other info - they would love to find out. THanks so much. hi I have been trying to find a list of passengers from the Ana Salen that arrived in Halifax in late 1951. I believe they (my in-laws) arrived in either late Oct or early December. They sailed from Bremen, stopped in Le havre and continued to Halifax. I am trying to get any info from that time. I would appreciate any assistance. My father came to Halifax, Canada July 1951 aboard the Anna Salen. Is there anyone else around that remembers that voyage? My father, Pandelis (Pantelis)Angelidis departed from Piraeus, Greece and arrived in Melbourne, Australia December 1953 before being sent to Bonegilla then Armidale, NSW before settling in Melbourne. My husband came out as a 14 yr old on the Anna Selen in June 1955 around the 16th? He boarded In Bremen. With his mother father & two sisters. His name is Gunter Franz Rieger now 73. his mother Lidia, father Franz coming from Gaggenau in the Black Forest area of Germany. he would love to contact others who came out at this time. my mom came from germany with 3 kids on april 19 1951,,,,,,,,are there any lists of names or pics..would love to see more.......dad was already here establishing a job and home for his family. My dad came over on August 7th, 1953 from Bremerhaven to Quebec City. Was anyone else on this voyage. Im going to download all his pics. I also was on the Anna Salen that sailed from Bremen to Halifax that arrived in Halifax on December 29,1951. Mr. Caz Nizman we were on that same voyage. I arrived with my parents (Walter & Ruth Mittelstedt)and sister on July 2 1954 in Melbourne on the Anna Salen. I estimate our stay at Bonegilla at about one month after which we went by train to Adelaide. My mother Maria (Bartoli)Jerala, my sister Lilliana, and myself, Anna left Braverhaven Germany and arrived in Halififax Nova Scotia in Dec. 1951. We were heading for Malartic Quebec. Where my father Francesco Jerala arrived in Sept. 1951 on the General Stugis. Some of the families we remember from Fiume, Istria,Dalmatia were: Racozzi, Buscemi, Guido Frank, Traven. Our parents are deceased. Lilliana lives I Grimsby Ontario. I live in New York City. If anyone was on that journey, we would like to hear from you. I was on the ship Anna Salen May 1955 from Germany. Where are the Passenger List for this Event? I would like to hear from Marliese Stanley who seems to have been on the Anna Selen the same time as my husband Gunter Rieger. My father (Karl Heinz Mathein) and his family (father - Hans Heini Mathein, Mother - Emmi Mathein, brother - Thomas Mathein & sister - Helga Mathein) traveled from Bremerhaven Germany to Australia aboard the Anna Salen in 1954. I do not know the exact arrival date. I have seen immigration documents and medical examination paperwork and it is all dated April/May 1954. If anyone can provide more information it would be much appreciated. Hi my husbands mother father and brother came on the Anna Salen on 31st December 1950 from Germany. They were very quiet people and did not say much. I'm trying to do family tree for my husband and finding hard to get information. If any one has any information or photos I would really appreciate it. My father Ewald Risse, his first wife Waltraud (Bahl) and my half-brother Walter (born 1953) arrived at Melbourne on the 16th of October 1954. He returned in 1957, some years later my brother followed him, but Waltraud Risse (or Bahl) lived in Australia until the 70's. I have always been curios about that time; and there must be at least two more half-sisters still (?) living in Australia ... So I was glad to find this site and maybe there ist someone who came across with my realtives in Australia. Anyway I want to collect more information about what happened on the ship and the years after. I left Bremerhaven and arrived in Melbourne on the 16th Otober 1954 age 7 years with my father Freidrich Wilhem Kirchhoff mother Ilse Kirchhoff and little brother Wolfgang .Does anyone have some information? I still can remember a little from that time and have some photos of our journey. My mother and father, Mary and Peter and my brother Paul and myself Zenna 4 years old at the time travelled on the Anna Salen Oct. 9-18, 1951. My mother and brother were seasick the whole voyage. My father and I walked the decks. We had to arrive in Quebec City as there were cracks in the bow and we could not go to Pier 21 in Halifax. awe settled in sault Ste. Marie Ontario. Any others out there who were on board on that trip? I was 14 years old when I travelled with my parents Heinz & Maria Schuchardt & my little sister from Bremerhaven on the Anna Salen in 1954, arriving on the 16th of October in Melbourne. Does anyone remember me? Would love to hear from someone. I have diary entries, photos and other material pertaining to the voyage of the Anna Salén from Bremerhaven to Halifax, June 16-25, 1952. I was aboard, 20 years old at the time. I was 8 years old whilst on board the Anna Salen. We departed from Bremer haven in 1953 and arrived on my 9th birthday 1954 at Melbourne. Our family name was Neubauer. Hi, My mother's name is also Helga and travelled around the same time. My parents left Greece on the Anna Salen and arrived in Melbourne in December 1953. They relocated to Adelaide a few months later, and I was born in 1954. I am surprised to see that the Anna Salen was a rather small ship. May I ask how many replies have followed since this Photograph I put on this site and is it a record number?. I have tried to count the replies but am unable to do so , anyway little did I think when the photo was put on just the amount of interest it would generate . Thank you Steven I knew it is a lot and some are sad reading as most who have contacted the site were D Ps (Displaced Persons)following the upheaval in Europe following the WW11 . So many sad children torn from the lives they knew in Poland and Germany to be transported to a foreign land and the unknown. Most likely made good but a very sad time for so many who had already suffered the ravages of war. I note one correspondent using this info for a book he is writing on this very subject. I have finished my book about our trip in 1952 and our life in Canada. If John Budge is interested he can contact me and I would send him a copy on DVD. Reading through each of the listed voyages the Anna Salem had made to a number of countries around the world transporting immigrants, i would be interested to find out how many voyages this ship made to each of those countries carrying immigrants to their new homeland. Muscardin Family. Our father came to Canada on the Anna Salen. He has the ships name as 'Santa Anna Salen'. To Halifax from Bremen Haven and landed April 1951. Pier 21 records do not show the ship landing in 1951. If anybody can provide more information, greatly appreciated. A look at the Internet suggests Anna Salen was a member of the family of Swedish businessman Sven Salen who bought the ship and re-named her. While Sven's family may have been saintly for all I know, I think 'Santa' must be a figment of your father's imagination, or faulty memory, Dean. Anybody out there that arrived on the Anna Salen in 1953? The S.S. before "Anna Salén" obviously referred to Steam Ship. If anyone wishes to have the real Ms. Anna Salén sanctified posthumously, I'll sign the petition. Why not? Everybody else seems to be getting sanctified these days. Peter Hessel (Bremerhaven-Halifax, June 1952). Error: The Anna Salén was not S.S., but M.S. (Motor Ship). I have just been reading the daily Anna Salen Newsheets for the voyage May to July 1954 from Cuxhafen to Melbourne. Swedish captain. No bedding on deck please. Do not lie around in bed all day because you are sea sick. A daily homily from a Catholic and a Protestant padre. Look after your children on deck. Danger of sunburn. Don't let traders from Aden into your cabin. Return the table tennis equipment by 5:00pm. Don't sleep on deck at night even if the cabins are stifling hot. Return the deck chairs by 5 :00pm and do not stow them in the lifeboats! The quality of the food is the same, it is tasteless because you have lost your appetite:) Fresh water will be rationed after Aden. Earthquake survivors will be picked up From the port of Piraeus. Treat them kindly. Library, kindergarten and English classes available . Please return your books. Two babies and an elderly lady died during the voyage. Fascinating! During WW2 the Anna Salen was an aircraft carrier, the Archer. I posted the original photograph in Jan 2008. Never dreaming it would create so much interest. My grandfather, Czeslaw Rowinski, and grandmother, Katyrzyna Skewers both came to Halifax aboard the Anna Salen in 1952. My father, who would have been 2 at the time, and his brother were with them as well. Very little is known regarding their whereabouts prior to leaving Europe. They both had been displaced from Poland and the Ukraine during the war. They had been in DP camps we believe in France and Germany, as my father recalls my grandfather telling a story of working in Paris for the US Army. If anyone has any information to share about DP camps in Germany, specifically around Breman, please share. My late father arrived in Halifax from Germany on The Anna Salen on Dec. 29, 1951. He described it as a grueling experience. He worked in the kitchen. Most days they fed very few people because of sea sickness. He said he made it through by sucking lots of lemons. My 18 yr old father Rainer Schmollinger and his Mother (my grandmother) Gertrude (Trude) Aulerich and partner Egon arrived in Melbourne on the Anna Salen 16 June 1955 from Freiburg Germany, boarded in Bremen. Both settled in Melbourne but now both sadly deceased. It sounds like the same voyage my Husband and his family were on. His name is Gunter Rieger..his story is earlier on this thread. Fam. Franz & Lydia Rieger and children..Hildtrud 18, Gunter 14 and Angelica 4yrs. Gunter & Hildtrud only members left and both are poor in health. Do you have any photos to share share with us please? Hi...my dad came from Germany to Australia on the Anna Salen in 1954. I think the ship stopped in Greece somewhere. Not sure where he arrived with the pictures of the ship there are pictures of Albury Western Australia, not sure if this is significant. Hello Monica, that is the same voyage I came on. I was 5 years old at the time. Do you have any pictures? We cannot seem to find a passenger list of that voyage. Hi, My grandfather, Johann Popp was on the Anna Salen from Bremen to Quebec. He arrived in Canada July 11, 1953. Was anyone on this specific crossing? Thank you. before settling in Mitcham in Melbourne. Has anyone been able to find the passenger list for this ship to Canada? My dad came over in 1953 to Quebec City. Does anyone have photos of the crossing from Bremerhaven to Halifax in June 1952? Hi Martin, I too was on the Anna Salen which left Malta on the 8th February 1955 and arrived in Melbourne around the 12 of March, with my mother and father, and brother. I was 5 years old and am trying to obtain same information about the trip. Peter, I have some pictures of that trip please contact me by e-mail. for the trip Germany to Australia arriving Melbourne 2.7.1954 contact the Immigration Museeum in Melbourne, they have a passenger list however one has to pay for this archive. I came on this ship as a 9 year old. The National Archives also have information about Passengers. You can access that online for free. I arrived from Germany in 1954 left Bremerhaven early March arrived in Melbourne in April around Easter. I know the months are correct as I actually turned 8 on board 28th March unable to find the exact arrival time it was the Anna Salen. Is there anyone that can verify arrival date. Just curious! I am researching my family history, I know my grandmother and 6 girls ranging from 1 year to 14 were on the Anna Salen from Brem Germany and landed in NS August 25, 1951 looking for anything thank you. My Father (Gotthard Wagner) and his Brother (Dieter Wagner) were on the July 2nd, 1953 trip from Bremen to Quebec. I would love to get any info (photos of life on board, passenger list, etc...). LOOKING for anyone who came on the ship Anna Salen, August 3.1953 arriving in Quebec City.They departed from Bremerhaven, Germany, July 1953. Looking for anyone who arrived in Quebec City on August 3, 1953 from Bremerhaven, Germany. I have a few pics. I commented before on the picture, my dad Wilhelm definitely came in 1954. Unsure of the month. I do have a couple of pics from the ship of some people i do not know..one of them is not exactly PC for today's times so i won't share here...my dad ended up working on the snowy mpuntains scheme. Email me on suess.j@hotmail.com if you think there may be a link. My grandfather was on board the Anna Salen, landed in Melbourne 16th June 1955. His name is Paul T Schulz. He is Polish, but would have boarded the ship in Germany. Does anyone have any information about him, or have any links to useful websites to find out more? I arrived in Halifax with my mother on the Anna Salen on Dec. 29, 1951. My mother recalled a terrible storm which damaged the rudder and took days to repair. As a cautionary measure the ship was rerouted from it's original destination of Quebec City to Halifax. This might explain why there is no record of it's Nova Scotia arrival in the Pier 21 data base. My mother, Lauha Hyytinen and my aunt Helen (nee unknown) were on the ship on the way backto Newy YOrk (I think) from the Olympic games in Helsinki, Finland. Mom was annoyed because the NYT spelled her names as "Laura" instead of "Lauha" in the article. I just discovered a photo album of them on the ship including photos of them, others with passengers and the ship's staff, and the ship. She has since passed away but said the trip - including the shipwreck, was an adventure of a lifetime! Gwen I was a passenger 8 years old on that trip, would be very happy to get copies of some pictures. Will gladly pay the expenses. Hello William Hehn, I too was on the Anna Salen that arrived in Halifax on Dec. 29, 1951. I was 5 years old at the time. Please contact me. This will rock you. My father, the late Horst Merkel of Bunbury, Western Australia, was the “Steuermann”, helmsman, at the time of the collision pictured. I remember him flying to London from Bremerhaven,where we lived for the court case. As I recall it no blame was attached to either party due to thick fog. I also remember the Olympic Rings being painted on the Anna Salen for the 1952 Helsinki Olympics while it was berthed at the Columbus Pier in Bremerhaven. My father was helmsman on the Anna Salen in he early 50’s. I remember his trips to Helsinki, Canada and Australia. He brought back several small flags from Halifax, Nova Scotia and New York. To cap it off, our family migrated to Australia on the Anna Salen on that 10 September,1954 trip to Australia arriving in Melbourne on 16 October, 1954. I recall passengers disembarked over two days. I was 8 at the time. We departed on day 2 for Bonegilla by train and later to Reid on the Transline in WA. From there we moved to Kalgoorlie where I left for Perth in early 1966. My mother and father moved to Bunbury in February 1970. They remained there until,their respective passing. My Dad was a keen photographer and amateur home movie maker. He filmed some of that September to October 1954 journey. I had it copied to disc. The quality is not the best. A highlight on it is the “Baptism” by King Neptune at the equator crossing. I still have my baptismal certificate. I hope this may help throw a little light on this journey for those who may be interested. My family and I also came to Halifax on the Anna Salen December 29th, 1951. We boarded at Le Havre with Montreal as our destination. My father was Emilio Subirana (1922-2007) and my mother Carmen Fernandez (1924-). My sister and I were born in France after our parents had left Spain by sneaking through the border. We originally had a refugee application for Brazil but we instead went to Canada. This was apparently the last free trip to Canada paid for by the International Refugee Organization. I remember the ship rolling very much and being tossed down the hallways by the motion. The other thing I remember was the awful smell coming from the cafeteria. I don't know what it was but I will never forget it. Everyone was very seasick except for the kids. My parents tell me there were several abandon ship alarms and that it was the worst storm in 25 years on the North Atlantic. We were very impressed by all the lights in Halifax but were given salted butter by the immigration people which we found disgusting. Canada worked out just fine for all concerned. My Uncle (Ignacio Subirana), aunt (Lola Pujol), cousins (Libert, Sara) and grandparents (Ignacio Subirana, Julia Gras) followed shortly after but had to pay their passage. Hi. My name is Loiza. My parents Konstantinos and Maria Psarras and my 2 sisters travelled from Greece on the Anna Salen arriving in Melbourne on 2/7/1954. We also went to Bonegilla before settling in Adelaide. I was 4 years old at the time and spent most of the voyage with my younger sister in the infirmary due to measles outbreak. My older sister was infirmed in Bonegilla. I have partial passenger list (with our names) from national archives in Canberra. Just found my Dad's landed immigrant card. I posted before that he came in 1952 but I was wrong. He landed according to this card August 3 1951 on the M.S, Anna Salen. It says his name appears on the sheet #30 line 21. How cool is that? He came cabin class and has his medical stamp...just says Landed Immigrant. I am sure somewhere I saw a photo of the ship so I am on a hunt for that now. Several boxes to go through. My mother Christa Edeltraud Bauer left Bremen and arrived in Quebec on July 13 1953 on the ms Anna Salen. Did you know her.